The Couples Retreat Oregon couples rely upon for healing and repairing bonds. "Stacy is a creative force for couples." Stacy is not only a certified Gottman Couples therapist, but a Master Trainer for their Institute. She blends this science-based couples work with her extensive work training couples therapists. Master trainer and workshop leader. Personally trained by Drs. John and Julie Gottman, Stacy conducts trainings and is a program development consultant to the Gottman Institute's program development department. You may know her for her group work helping couples in this science-based group training in the Gottman Method. She works more deeply with one couple at a time in this private Couples Retreat Oregon location. Stacy works with the Gottman Institute to create new programs. (Stacy is in the first row left with fellow Master Trainer Dave Penner) The Gottman Institute houses the Premier Researchers of Couples. Why a Couples Retreat Oregon? There are hundreds of options for couples retreats across the country. Most are group psychoeducational retreats. Some offer a beautiful location and luxury accommodations. Many offer relationships a "couples getaway Oregon" experience. Some are faith-based or focused solely on improving your communication. Ours are different. Couples Therapy Inc. offers marriage retreats which are private therapeutic intensives. Pick a Couples Retreats Oregon, or location. If you're in relationship distress, or want to dramatically improve how you are relating now, book a retreat. Our marriage counseling retreats help one couple at a time to reconnect, improve their communication and rebuild trust. Stacy Hubbard has been helping couples in Oregon for a decade. We're the Couples Retreat Oregon relies upon by couples of all kinds: straight and gay couples, those in long-term relationships, international couples, newly engaged or newlywed couples. Even couples facing the crisis of divorce. Stacy is a Master Trainer and Certified Gottman Couples Therapist with the Institute. One of 26 worldwide. She'll help you to break down barriers, and open up to the heart of important issues. She knows how to help Oregon couples address long standing areas of conflict, infidelity or affair recovery, divorce threats, and complications such as managing early trauma histories, mental health issues, or extended family struggles that affect the partnership. She sees couples from around the country and the world. Stacy Hubbard is one of 23 Couples Therapists at Couples Therapy Inc.
A gifted part of Oregon's therapeutic community helping couples. When your relationship faces stress, infidelity, or the threat of divorce, don't wait. Get a jump-start and change around your relationship dynamics with a thoroughly trained expert with more than a decade of science-based experience. A Couples Retreat Oregon relies upon. One-hour by air, 4 by car from Portland, Oregon. Selected as a top 10 finalist in Outside magazine’s search for the “Best Town in America,” Ashland is a culturally rich mecca for tourism, entertainment, entrepreneurship, and breathtaking outdoor experiences. 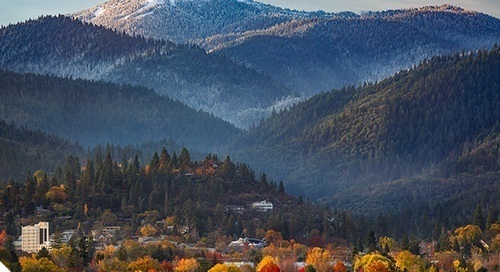 Gorgeous Ashland, home to Southern Oregon University, is famous for The Oregon Shakespeare Festival that stretches from February to October each year. The Shakespeare Festival as become the largest regional repertory theater in the United States. Ashland is also famous for its many restaurants, galleries, and retail stores that cater to tourists. Baloneys and antiques. A lovely place to stay for your Couples Retreat Oregon - Ashland. The Ashland Creek Inn is a world unto its own with both a private entrance and private deck overlooking a picture-perfect, park-like setting right in the heart of town Ashland, Oregon. Reminiscent of an old-world boutique hotel, all ten suites were personally appointed by innkeeper Graham Sheldon with rare antiques and artifacts brought back from his extensive travels to exotic locations around the world. I'm not in Oregon .